I still have Iceland on my mind. Over the past two weeks, I saw the greatest sunset and the strongest winds of my life; I walked through a pathless desert to the edge of a canyon, and I climbed a glacier lit by the midnight sun. Iceland is stark and surreal — reminding me of an alien planet more than any landscape I have seen before. It is nearly impossible to write a faithful article about such a country, and no photo could encompass the beauty of this magnificent island. Although I am working on a future page with more specific tips for photographing Iceland, this essay is more simple — a collection of my thoughts after the trip, alongside some of the photographs I took along the way. To start, I should mention my schedule — or rather, my lack of schedule. Throughout fourteen days, my goal was to travel clockwise around the island with my dad, photographing some of the most wild landscapes in the world under the best light I could find. 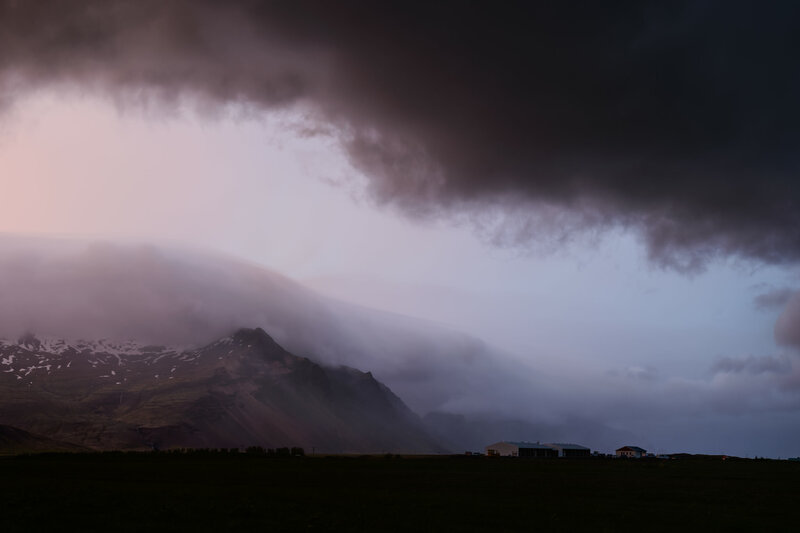 I was chasing light as much as I was chasing land; Iceland is known for being overcast and stormy, but its conditions vary constantly. I slept in a tent for all but three nights. Actually, that is misleading; I slept in a tent for all but three days. To be awake during the best light, I flipped my schedule completely; instead of sticking to normal hours, I tended to sleep from about noon until eight at night. Iceland is located on the edge of the Arctic Circle, so it sees 24 hours of sun during parts of the year. In fact, I timed my visit specifically to coincide with the summer solstice. Why? During the longest days of the year, the Icelandic sunset stretches into sunrise; golden hour becomes, more accurately, golden eight-hours. Many sunsets during my trip were foiled by clouds; it is Iceland, after all. But some nights were amazing, with pink and gold tones resting for hours across the horizon. Two nights before I left, the sunset arrived with a storm and lasted for more than an hour — the best hour of lighting I have ever witnessed. In retrospect, my nontraditional schedule was almost perfect. I ate when I was hungry, then slept when I was tired — and I saw amazing landscapes under perfect light along the way. Some of the most popular sites in Iceland, including the most powerful waterfall in Europe, were utterly empty when I visited in the middle of the night. Camping for most of the trip, especially under 24 hours of daylight, I had no real need to be on a standard sleeping schedule. Although it was indeed harder to find food, the payoffs of lighter crowds and softer light made my schedule a wonderful decision. When I return to Iceland — and I certainly will return — I plan to live on the same schedule. 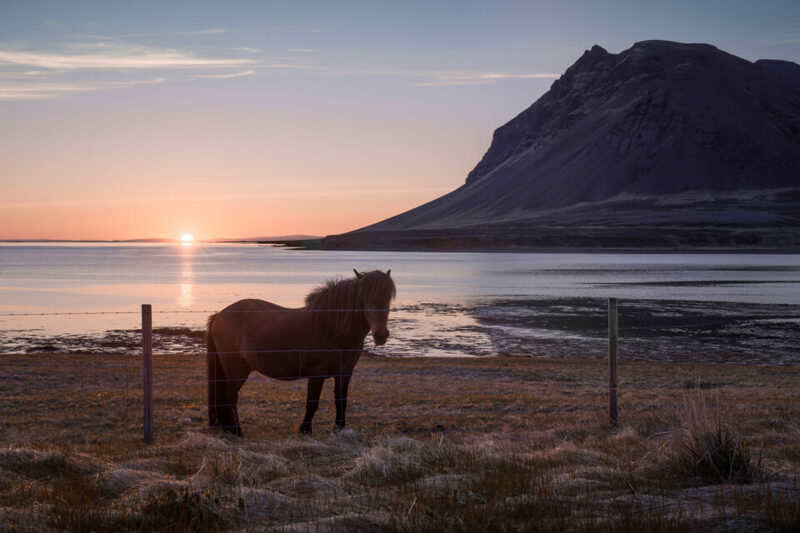 Part of the beauty of Iceland is that you can stop your car whenever you see something intriguing, and you will nearly always have one of the most beautiful backdrops in the world to complement your view. I can hardly list the crazy stops I made on this trip — a reindeer, a rainbow, an Icelandic horse at sunrise, a foggy mountain pass, dozens of unnamed waterfalls, a sunbeam-dusted fjord, and the beautiful, moss-covered mountains of Þakgil. Stopping every twenty minutes may be inefficient, but I believe that it is one of the most worthwhile and personal ways to experience a country like Iceland. I also saw quite a bit of snow. Although my visit was late in June, Iceland’s tallest peaks and coldest valleys still looked as though they were stuck in mid-winter. Like liquid water, snow subtly reflects its surroundings and matches tones with the sky — and it is one of the most peaceful elements of any landscape. 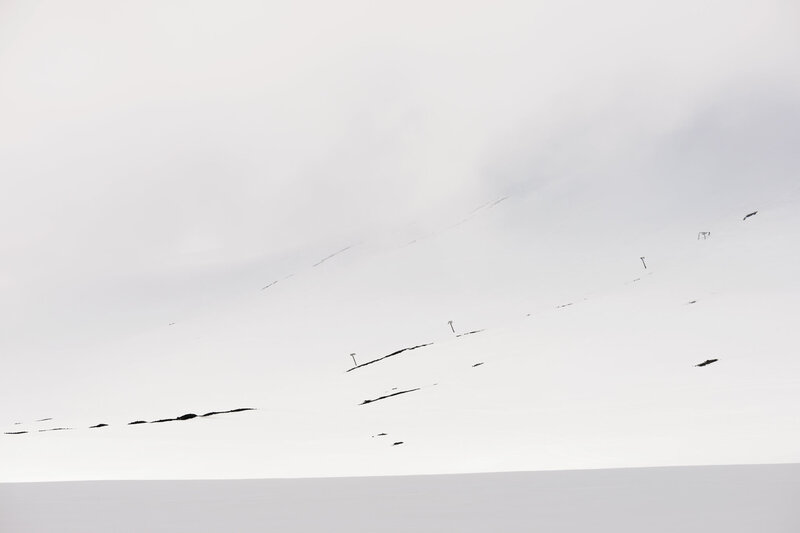 One of my favorite images from the trip is a snowy abstract from Snæfellsjökull mountain. Hiking up the glacier on the side of this volcano was exhausting, but it was also one of the most rewarding experiences of my life. 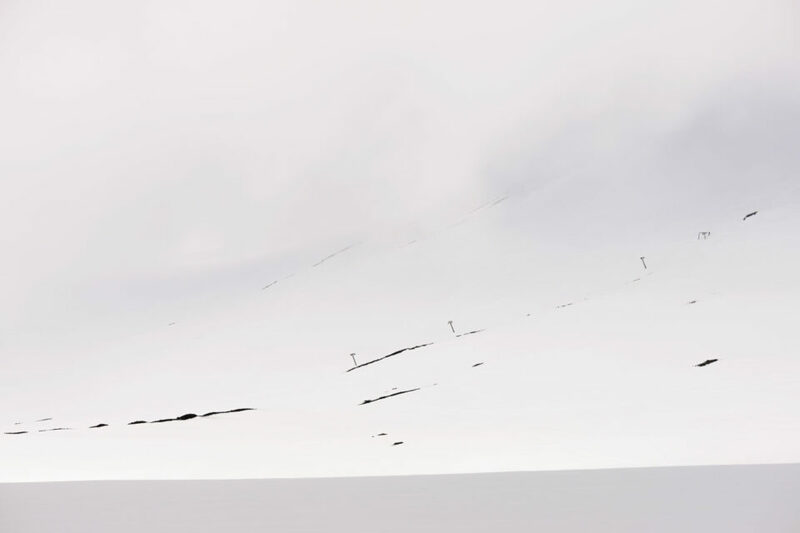 Though this photo appears monochromatic, it is indeed a full-color image — that is the wonder of a snow-covered landscape in Iceland. I did not expect to see such intense national pride from the people I met in Iceland. In every gas station, restaurant, shop, farmhouse, and grocery store, pictures of the Icelandic landscape lined the walls. The flag of Iceland, too, was placed prominently on everything from boats to chocolate bars — I felt that the Icelandic people truly loved their country, perhaps more so than the people of any other place I have been. Maybe this pride exists because Icelanders depend so heavily on their land for their sustenance — everything from geothermal heating to tourism money stems from Iceland’s landscape. I like to think, though, that the connection between Iceland’s people and land is more profound. Iceland is a community of less than 350,000 individuals, and they share one of the grandest and most beautiful places in the world. It makes sense to me that their buildings are filled with landscape images — this way, it is impossible to forget the beauty that is always around them. Prior to my trip, I was surprised to see that I could not find any hidden-gem waterfalls mentioned online, despite hours of searching. Upon arriving, though, I soon realized my error — every part of Iceland is a hidden gem. 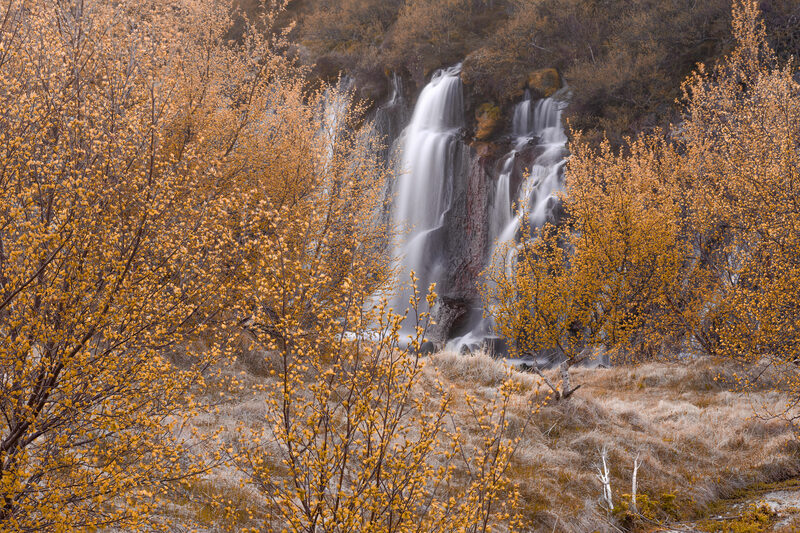 There is no “secret falls” in Iceland; there are just waterfalls everywhere. Nearly every mountain across the country has dozens of ten-story waterfalls cascading down its face, thin run-offs of melting ice that are as ubiquitous in the landscape as are Icelandic horses. 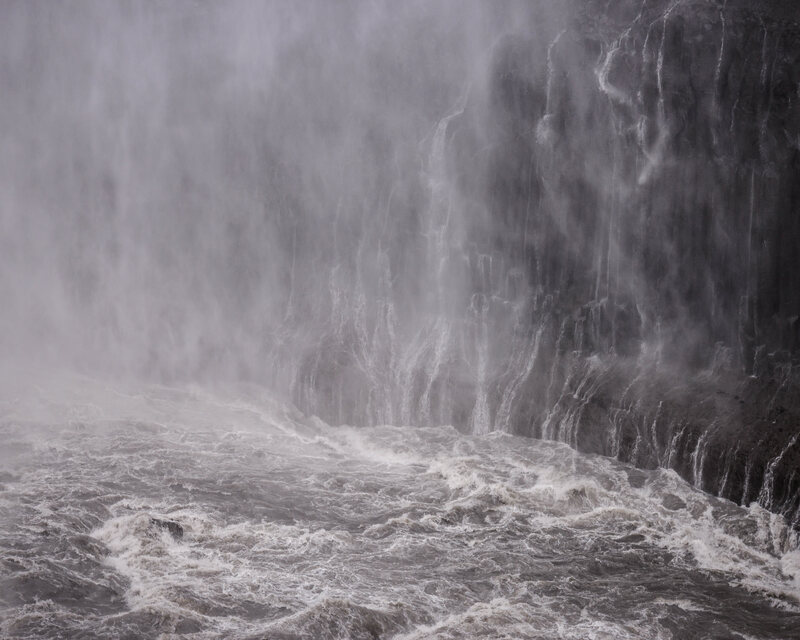 If you want to photograph waterfalls in Iceland, it makes no difference where you are. Pull off to the side of the road, and you will have a magnificent waterfall in view more often than not. Such a feeling — to see low-hanging fruit in every direction — is maddening and wonderful. As a photographer, it is impossible to do anything but appreciate such a landscape; these scenes are worthy of hours of photography, but it is impossible to visit them all. To travel through a world like Iceland will render you both spoiled and humbled. In such a small area — roughly the size of Indiana — Iceland manages to hold nearly every landscape imaginable. Prior to the trip, I had heard that Greenland is icy, whereas Iceland is green. Anyone who makes this claim has never visited Iceland. 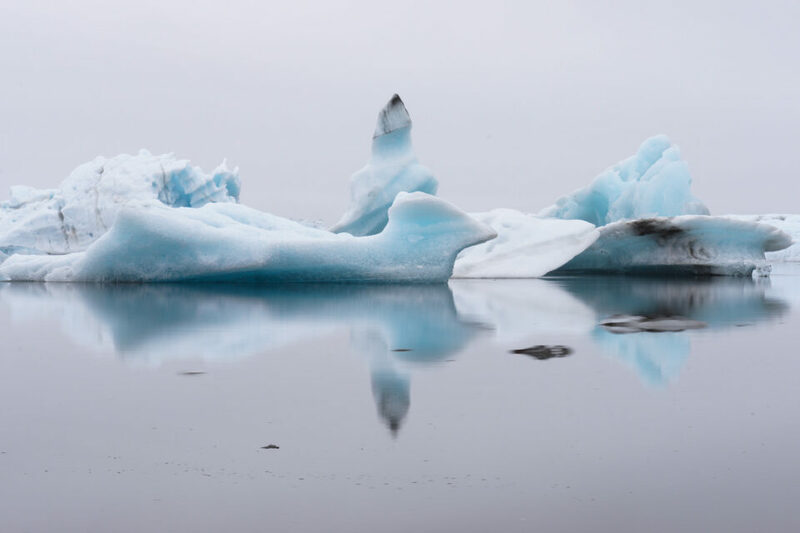 Iceland is blue, in its glaciers and icebergs. The northwestern desert is gray and brown — both the sky and the land. In the south, black and green run across the landscape, while the skies stay dark and stormy. 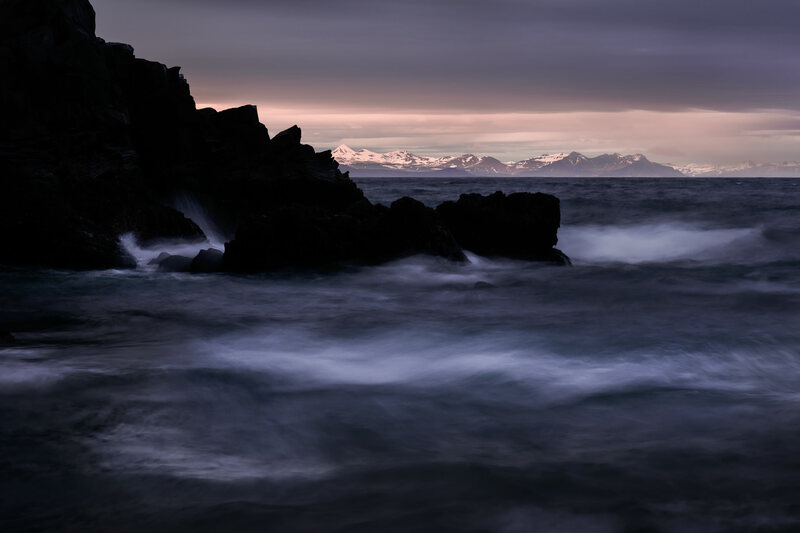 Further, the Snæfellsnes peninsula is pastel in color, everything from the glacier to the rivers. Inland, Iceland’s volcanos are deep black and bright orange, glowing with light. And the snow is white, all across the country, though it subtly reflects the tones of the sky at dawn and dusk. 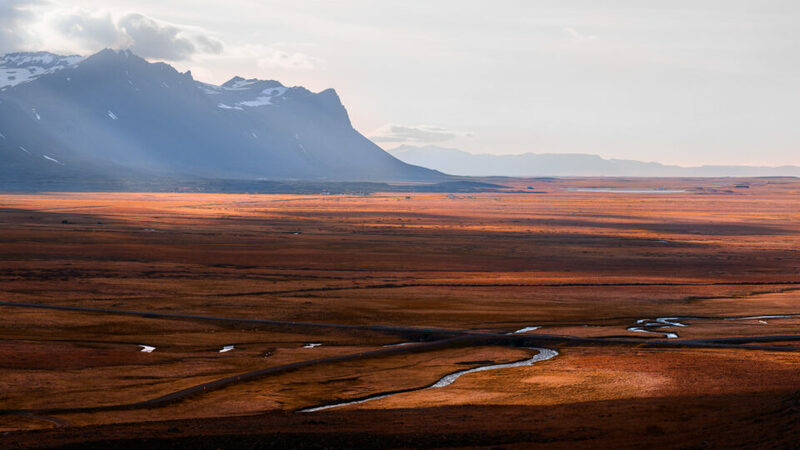 Iceland is not just green, and it is not just gray. Iceland is every possible color. Iceland taught me quite a bit. On my trip, I learned the best way to ford a river; I found the best way to approach a herd of reindeer without frightening them, and I realized the fun of living off a schedule. Every day I traveled, I felt like I was discovering something new. I learned one thing, though, that matters more than the rest — something that I could not have known prior to the trip. In the near future, I will be publishing more photographs from Iceland on Photography Life — in the mean time, feel free to visit the landscape photography gallery on my website if you would like to see a few more images. Wow that place looks amazing! Can you tell me why you chose the 105 and 50mm lenses? In truth, I had not expected to use my 105mm lens nearly as much as I did. I brought three lenses to Iceland: a 24mm, a 50mm, and a 105mm. Prior to the trip, I would have said that my 24mm would be most-used, by far. I took about 900 photos at 24mm, 500 at 50mm, and 1700 at 105mm. Some of that is distorted by panoramas and bracketing, but it’s still fairly accurate. I really enjoyed taking telephoto landscapes in Iceland. I know that’s a bit unusual, but it I didn’t really think about it consciously. I’d imagine that most people would be better-served with a wide angle, perhaps a 14-24mm, but I rarely would have used such a lens on my trip. I’ll be going in mid-September and think I’ll take just my 14-24 f2.8 and the 24-120 f4 on my D810. From what I’ve read, I don’t think there are many telephoto opportunities, since I won’t be doing wildlife. If I could have had just one lens in Iceland, I would have chosen a 70-200 (looking back on it). Unless you plan to see nothing but the highlights, the vast majority of amazing landscapes in Iceland are in the distance. A 24-120mm might be enough for you. My longest lens was a 105mm. However, throughout the entire trip, I really felt like I was missing something longer. And this is coming from someone who never shoots wildlife; 9/10 times that I pulled over to the side of the road for photos, I was at 105mm, wishing I could zoom a bit closer. Personally, I would try to add something in the 200mm range to your kit. Perhaps you will not use it, but for me it would have been my most-used lens, without a doubt. All that said, though, most people’s needs would be different. Certainly the most famous sites of Iceland (the Golden Circle, Jokulsarlon, Dettifoss, so on) are mainly made for wide angles. Thanks for the reply and I apologize for misspelling your name in the original post. I’m taking the 14-24 for night shots, so it’ll stay in my bag most of the time. I appreciate the information about many sights being far from the road, so I’ll pack the 70-200 beast, too. Thank you so much! The 14-24 would be perfect for auroras. Definitely agree that the 70-200mm is most useful in Iceland. 24-120mm is useful if you want to just carry one, but my favourites came from the 70-200mm and 14mm. I actually brought a drone to Iceland! I will be sharing some of those photos shortly. 105mm haven’t crossed my mind for landscapes. Normally someone would use it as a portrait or macro lens. Did you shoot any macro when you were in Iceland? At the moment, I am considering a 60mm or the 105mm. I only shot a few macro scenes when I was in Iceland. However, if you are hoping to do a lot of macro photography, a 105mm lens would be ideal. The longer your macro lens, the farther you can be from your subjects. You don’t want to block the light that reaches your subject, and sometimes you are photographing something that you don’t want to be near (i.e., a spider or wasp). I found the 105mm to be indispensable for landscape photography, although it’s not as useful if you already have a telephoto covering that focal length. You are right, I already have my favorite 70-200 to cover that (105mm) focal length. I am not really into macro photography, but looking for a close focusing lens where I can shoot in a small room where subjects (cats in the shelter) won’t be blurry if I get in too close. That’s why I was thinking of the 60mm for wider shots than the 105mm in tight spaces. Simply the most beautiful place I have ever been! That horse shot (Image 7 I think) is exquisite. Iceland is indeed a fantastic country. I visited the country in March this year. I think that Iceland is at its most beautiful during the winter time. The rough landscape is amplified by the rough weather conditions, which literately change every 5 minutes. I will certainly go back to Iceland; I have nostalgia when I see pictures from Iceland. Here’s a thought: maybe we could organize a visit with a small group of Photography Life readers? I would have loved to visit during the winter! Some of the coolest mountains I saw (including Stokksnes) didn’t have any snow. Thank you, Jacobus! Iceland was a pretty inspiring place. Such a splendid share Spencer! I am immersed in your story, comments, and of course your images while taking a mid-afternoon break. Great compositions spencer. Can you advise me on the best time of year to travel there? I might be travelling to scandinavia in october. Is that time of year too cold to visit iceland? Not too cold in October, more so in December to Feb. Best time to see the northern lights is around Feb/March, although they can be seen between September and March. First time I went in a February it was covered in snow (and quite beautiful), second time was also a February and hardly any snow. Winter – Snowy and dark, of course, but you get to see the northern lights. Plus, no one else will be at the most famous sites. Spring – some highland roads are inaccessible, but the landscape is beautiful because it’s still dusted in snow. Still possible to see the northern lights, and there is more daylight. Summer – 24 hours of daylight at the right time (mid-June), although some roads are still closed early in the season. July and August are more crowded, but all the roads should be open. Fall – Similar to spring, but less snow in the landscape. Thanks Spencer and Sharif. Hows the terrain? Is it mostly flat or do you have to hike and climb a lot? Lots of climbing. Unless you’re planning to stop at nothing but the highlights, you’ll be hiking quite a bit. Almost everywhere in Iceland is hilly, but some places are better for hiking than others (i.e., slippery gravel versus grass). It’s generally not dangerous terrain, but it can be strenuous. Nice images, Spencer. Been to Iceland a couple of times and it’s a great place to shoot. Thank you, Sharif! It’s definitely an amazing location, probably the best place I’ve ever been. Beautiful photos — thank you for sharing this link. I especially like your images of the ice cave. Thank you for sharing the timelapse. I didn’t see any active volcanos on my trip — that is quite impressive. Thank you for sharing such beautiful photos and the useful information about traveling in Iceland. I’ve been wanting to go to Iceland for a long time and the thing that worries me the most is the car rental situation over there. I’ve heard some horror stories about people having to pay for damage caused by nature, that the insurance wouldn’t cover, even though they had purchased the most comprehensive insurance when they rented the car. The information about this subject in travel books (Lonely Planet, etc) is very limited. How was your experience with car rental? Any advise? I rented from a company called Blue Car Rental, and I was thoroughly impressed. They seemed the most lenient of all the companies I found, in terms of light damage covered by insurance. Other companies may be similar, but I can recommend Blue Car Rental without hesitation. Tomorrow I’ll be coming back from my own two week holiday in this spectacular island. Can’t wait to come back in a darker season, haha. If it’s of any help: I did a trip around the Island to see the highlights and a couple of accessible “hidden gems” and brought along a 18-35G paired with a D610 (it was the “beater” for when I wanted to get close to the waterfalls), a 24-120 attached to a D810 (will allow some cropping) and a Sammy 14/2.8. It’s been enough but at times I wished I had my telephoto. The Sammy was the only one that could get the craters or Seljalandsfoss’ back in one shot, but even though I would’ve enjoyed the convenience of a wider zoom I felt really comfortable in the 18-35mm range, if you’re not a sucker for UWA like me 24mm may just be enough. Thank you for sharing your experiences! Some shots — Seljalandsfoss, Jokulsarlon, Kirkjufellsfoss — are only possible with an ultra-wide. Personally, I am able to compose images better in the 24mm+ range, but I think that most people would find Iceland to be one of the best places in the world for an UWA perspective.